Join reknowned infusion expert Flower Bullock of Stoner Girl Treats & Eats for an in-depth, hands-on 2-hour Puff, Pass & Pamper night, where you treat your skin with the very best of the earth’s medicine. 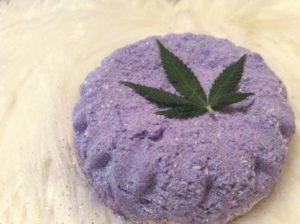 Learn how to make your own THC facials, infused bath soaks, and medicated lip balm. Puff and pass your way into fun and relaxation! You can enjoy your tasty treats in a 420-friendly setting while learning, and there is plenty of time to ask questions so you can take your new-found skills back home with you! Stoner Girl was born in 2014 in a small dorm room in LA, and breathed life just 4 years later, at the turning point of the cannabis industry in Washington DC. Stoner Girl was created by Chef Flower Bullock, a former pastry arts graduate from The Art Institute of Santa Monica-California, who originally reloacted to Washington DC to work with various animal rights, activist, & human rights organizations before taking her two greatest loves and merging them together to take the cannabis world by storm. She firmly believes in reducing our carbon footprint and merging a plant based diet and the healing powers of cannabis so we can inspire, create, cultivate, change the world, & heal the nation! One complimentary glass of wine included with your ticket! 21+, BYOC, no cannabis is guaranteed in the cost of your ticket to comply with local regulations for consumption-friendly events. Address revealed after booking to comply with local regulations for consumption-friendly events.